Oh Em Ghee, can you believe my mother let me do this? NEVER in a million years did I think she would say yes when I suggested painting her dresser coral! I nearly fell over, then I ran to the hardware store to get the paint as fast as I could, before she changed her mind. She needed a coral painted dresser, and I was just the lady for the job (plus I’m free, she had no choice). Look what I started with, the dresser was in great shape, just verrry dated. It needed a little Virginia TLC. I chose Smoked Salmon (PPG1189-5 | 131-5) from Pittsburg Paints Voice of Color collection in an interior Semi-gloss latex. It took one coat of primer and two coats of paint, which I managed to do in a day. Amazing what I can accomplish when my mom is wrangling the kiddos. 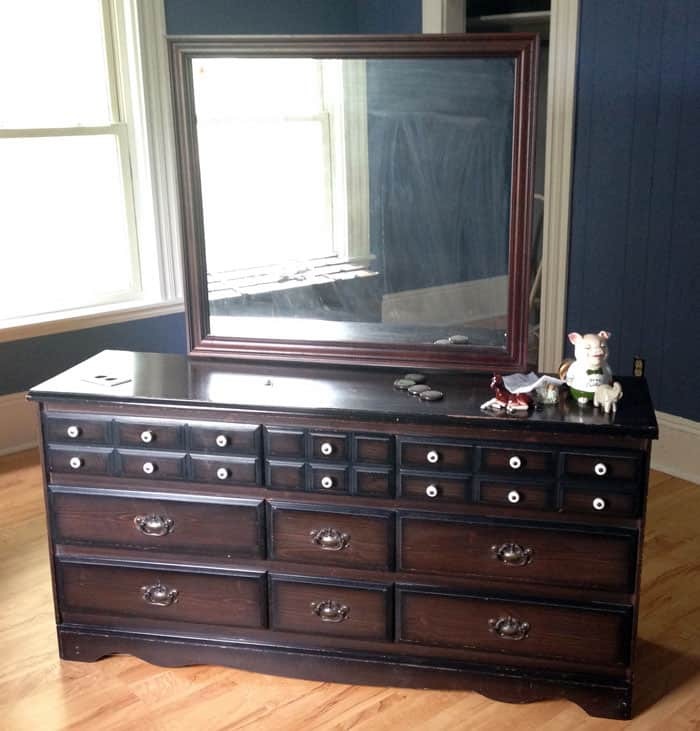 Can you believe this dresser has 20 pulls on it! We went with the cheapest ones the hardware store had (and since I had the idea and did it all in one day, there was no time for shopping around). In hind sight I probably should have spray painted the old ones. I love the Smoked Salmon with the Blue Violet (147-6) my mom chose, it’s almost refreshing to see it Coral not paired with mint (don’t get me wrong I love that combo, but is getting to be what everyone expects). 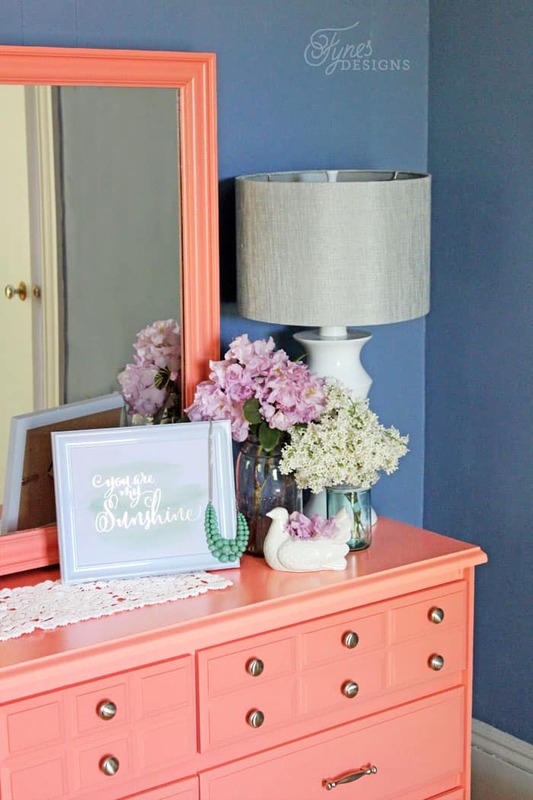 I’m really happy how this coral painted dresser turned out, it really gave this bedroom a new breath of life. What do you think of the blue and coral color combination? 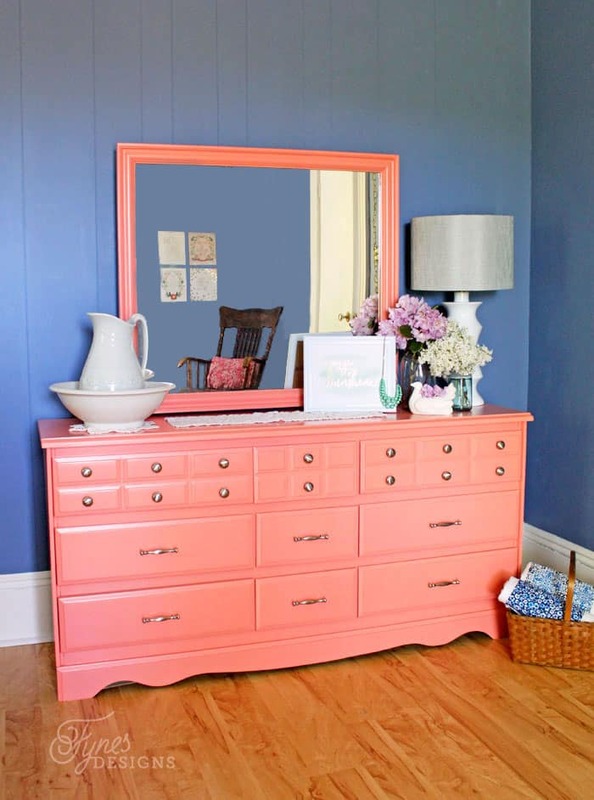 Would you have the guts to paint a piece of furniture a bold color? Beautiful! What did you do to prep before you painted? I absolutely love this Virginia – it looks awesome!! It looks awesome Virginia. Love the Market Street prints on the opposite wall! I love it! 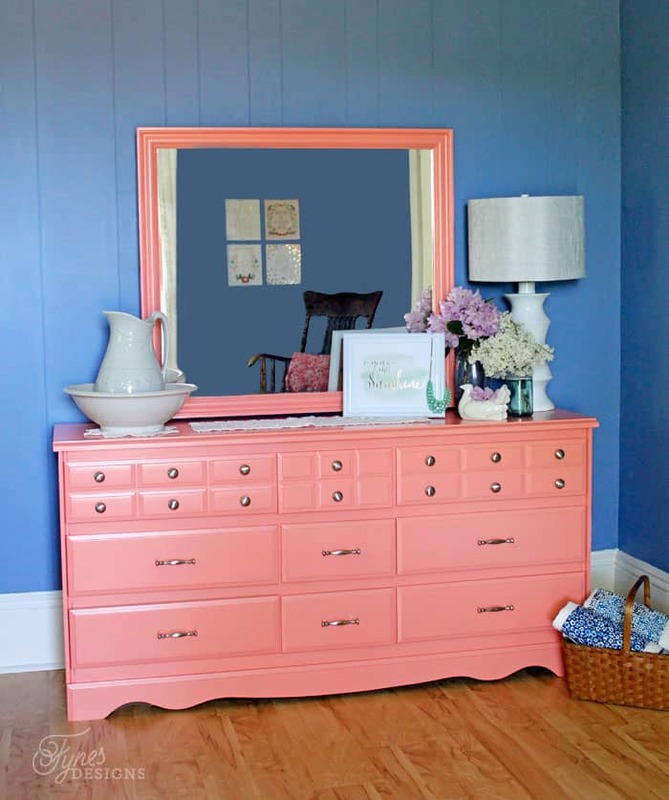 I would never have thought of coral for a dresser. Now I am eyeing up my dresser….. Great job! Thanks Shannon! I constantly have that wondering eye, nothing is safe from my brush! So awesome! I currently am crushing on coral really badly. The dresser looks great! Gorgeous! I have wanted to paint my old white dresser for a while now, but am scared that I will ruin it. My question is the same as Megan’s – what did you do for prep before painting? I always imagine horror stories with stripping paint and sanding, etc. That’s why I’ve been hesitate to try to redo. No horror stories here! I used B-I-N for the primer coat. You just paint it on, and it adheres to any surface, plus only takes an hour to dry! Then you just paint your color on. Works like a charm. I would recommend each layer of paint have a good amount of curing time though, before you do another coat. I love the color coral. The dresser looks great! Love it! It turned out so beautiful and the color is perfect! Thanks Bethany! I’m loving it too! What a wonderful transformation! I absolutely love the bright coral color! You did such a good job! We would love it if you would join in on our Awesome Things Tuesday Link Party! Beautiful! I love in a beach community and I know some folks that would flip over this piece! What a STUNNING makeover!!! P.s. you are a genius for putting coral in front of that wall–looks so fantastic! I absolutely love this!! Coral is such a pretty color. Thanks for linking up at the Bewitchin’ Projects Blog Party! Beautiful makeover! 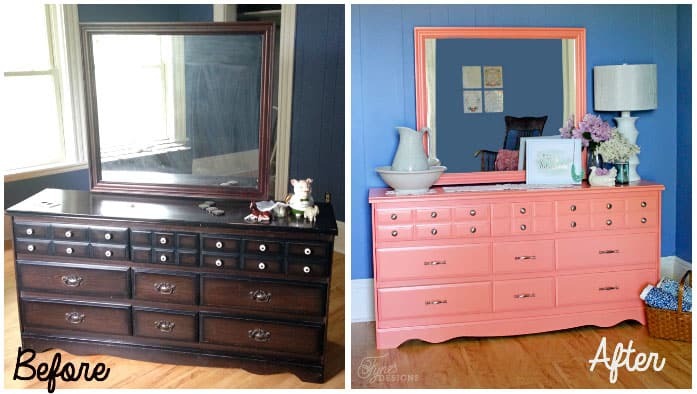 I love the color, and I like that the dresser has a huge mirror and lots of drawers! I love the color! 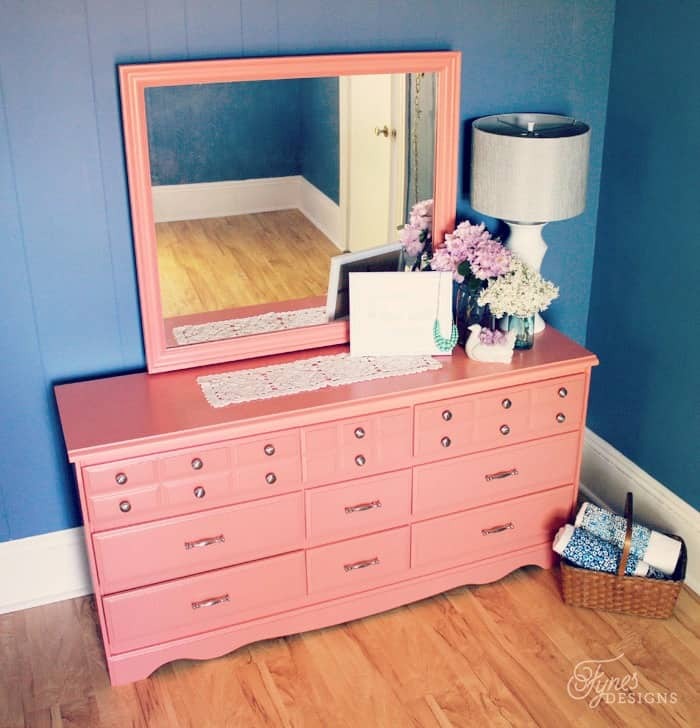 We are looking to paint a similar looking dresser a coral color for our daughters’ shared bedroom. What a difference! It really added an awesome pop of color to the room! Thanks for dropping in! Wow, the color is beautiful! You did an amazing job with the paint. Did you use a to foam roller to apply the primer and the paint? Did you sand it at all in between coats & if so what grade of sandpaper? Did you use a paint brush at all? It looks perfect with no brush strokes etc. Amazing job! Hey Marissa, I didn’t do any sanding! I just used BIN primer and then painted 2 coats. The key is to let it dry a few days before you use the piece so it has plenty of time to cure. Good luck! So beautiful, my daughter wants me to paint her antique vanity, it has burned marks from my previous daughter leaving her curling iron on it. Not too bad but I was thinking I need to sand it. If I use the B I N primer, do you think it will cover that without sanding? I want to paint it so badly but I’m chicken. BIN is amazing, but its an oil paint so a bit messy. You won’t have to sand at all, unless of course the wood is rippled from the burn marks, then you might want to just to make that go away. Be bold, you can do it!! I’d love to see the before and after!